Fabulous photo that has it all, received from John Bedford, Cabridge (UK) saying he purchased six Victorian albums at auction and is trying to research names and locations of photos. This is only one with a car. -- P 3542 registration is Surrey CC but early records have been lost. The make is a Daimler and the car is a big beastie of larger hosepower. Car and coachwork look cca 1906, which ties with the reg, and the engine is probably the 35HP 4 cylinder. Rear opening bodywork is a Landaulette. 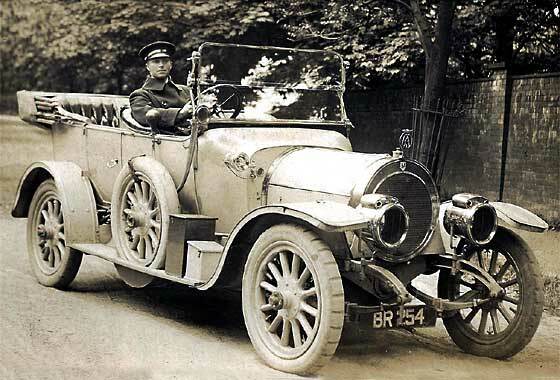 Interesting photo received from Shirley Playford (UK) marked: " Early Motor Car. Mr & Mrs Frank Rogers" of Mayfield. 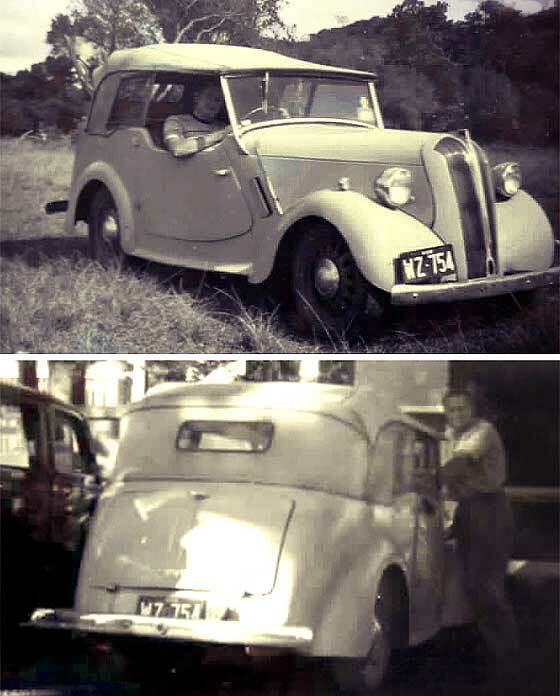 Mayfield Historical Society are keen to identify the make/model/age of the car. -- Quite an unusual car and not many photos of this model. No discernable registration, so no aid to specific dating but the round central part to a square radiator was the feature of a cca 1907 Singer Two-Seater, possibly the smaller 8'12 Model with the two cyl. White & Poppe Engine. 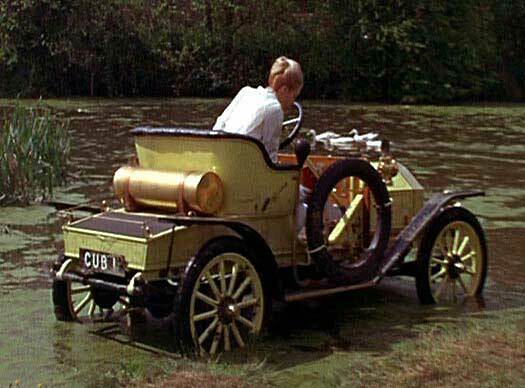 Photo received in 2006 from Colin Green (UK) who is a fan of the 1968 film Chitty Chitty Bang Bang, and wanted to know what type of car it is that 'Truly Scrumptious' drives in the film. -- We advised it was a cca 1909 Humber 8 and that reg CUB1 was incorrect for car. Had feedback from Philip Barrett USA saying the plate belonged to Albert "Cubby" Broccoli's, the film's producer and that reg was normally on his Rolls Royce. Phillip says he thought it would be amusing to slip it into movie. Confusing cinema screen grab of a vehicle which appeared in a British film "Nicholas & Alexandra" made in 1971, where the vehicles are being investigated by IMCDB. Based on the last days of Tsar Nichloas II and includes a scene of this car during the assassination of Franz Ferdinand in Sarajevo. -- He was most certainly not assassinated in a French cca 1911 De Dion Bouton, which this is, but in an Austrian 1911 Graf & Stift Phaeton, - but presumably filmakers think only car buffs would notice. 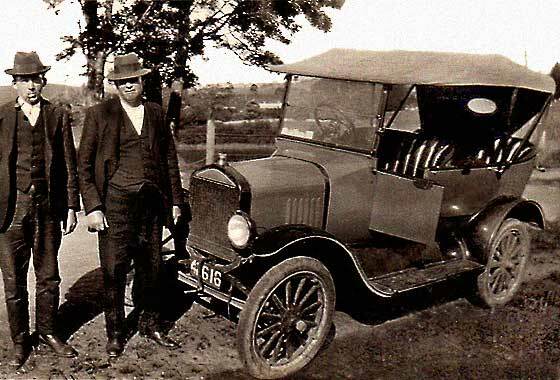 Superb photo received from Bill Shiels of Calgary, Alberta (Canada) on which was 'Uncle's Car', and uncle could be distant relative who was well connected in Belfast. The chauffeur may be driving the car. -- BR 254 is registration issued by County Borough of Sunderland which is on the north east coast of England and not Ireland? 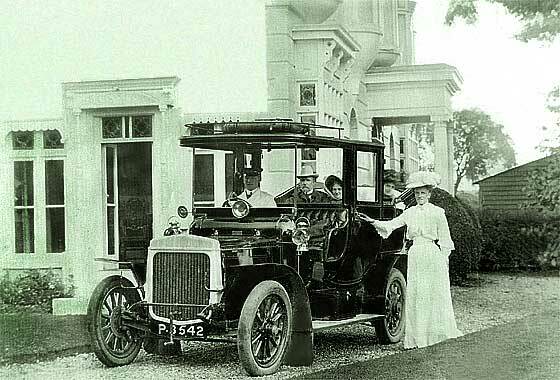 Reg is also cca 1904/5 whereas the car is a cca 1912 Maudslay Sweet Seventeen Tourer. AA badge has wings, so post 1911. So carries retained 'cherished' number. Formal photo received from Margaret Rackham (Australia) researching the Dransfield Family (original photos found in Romania!) and is currently scanning family photos in Australia dated 1923/26. -- Quite clearly an American car but with hand drive. Transverse spring so a Ford Mode T. Rounded bonnet and electric lights, so post 1915. Our friends at the AACA recon it is a Canadian chassis with an Australian made body, and windscreen, and so a cca 1922/3 Ford Model T Touring. 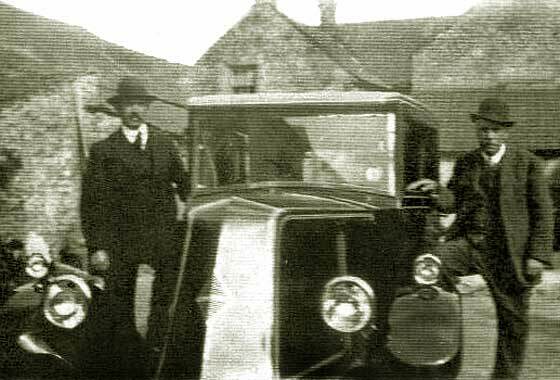 Damaged photo, which we have repaired, received from David Robinson (UK) showing his Gt Grandfather as front passenger. Possibly Skegness. -- When much magnified, the registration seems to be CL379# which would be a 1920 Norwich County Borough Council registration. Car is American. There is no headlamp tie bar so this is a cca 1920 Chevrolet 490 Four Touring, which ties in with the registration. Difficult to identify pier, but to us looks more like Great Yarmouth ? 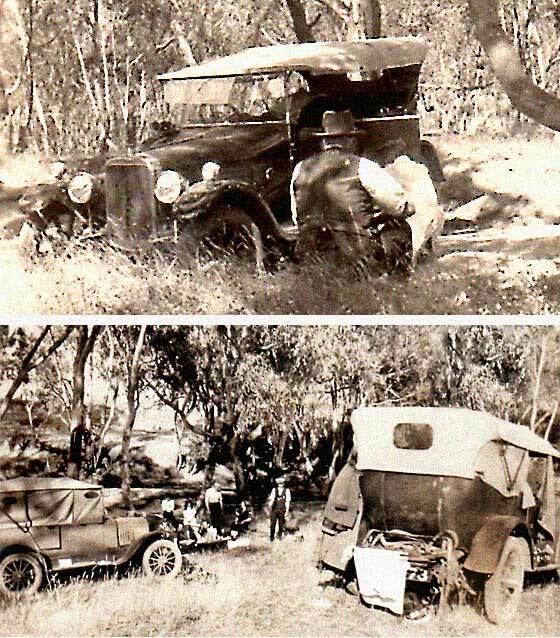 'After accident' photo from Margaret Rackham (Australia) researching the Dransfield Family (original photos found in Romania!) and is currently scanning family photos in Australia dated 1923/26. -- Nice to see a British car which was confirmed by our Sunbeam expert Bruce Dowel as being a cca 1922 Sunbeam 16hp Tourer, dated by having rounded wings with sidelights on top. He has records of seven similar period models in Oz. 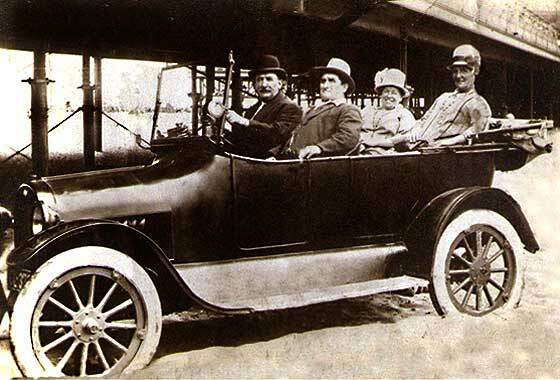 Pictured with the 1916 Model T mentioned above. Nice photo received from our Singer expert Simon Bishop (UK) who got it from somebody in the Sunbeam Register having purchased the photo thinking it was a Sunbeam which it is not. Not a Singer either. Clyno, but did Clyno made a car that size? -- No, not a Clyno but a car made north of the English border in Scotland. This is a cca 1923 Arrol Johnson 15.9 HP 'All Weather' made in Heathhall, Dumfries. One of the first British car manufacturers as Mo-Car Syndicate, closed as Arrol-Aster in 1931. 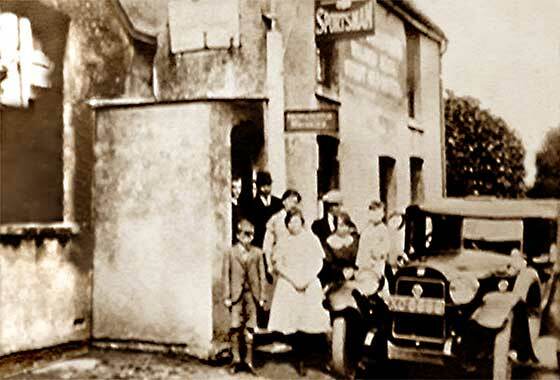 Fuzzy photo from Julian Stinton, Bristol (UK) he found on a website while investigating wife's ancestors, licensees of the Sportsman pub in Sholden, near Deal in Kent from 1910 - 1912. Suggested the car is a Maxwell, made in Kew. -- No trace of a UK Maxwell. Is not an American Maxwell either. Quite unusual. 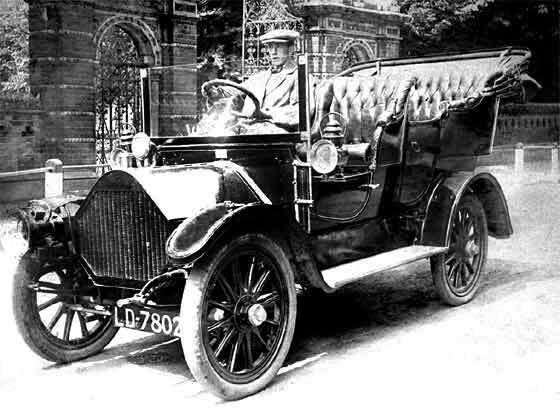 Seems the chassis was a cca 1923 Buick but with a British fixed-head body with veed windscreen, and lighting set. Reg is London 1923. Similar bodied Buicks elsewhere, - no maker. Lineup of cars photo received from Julian Stephens (UK) who is the Operations Director of the Lost Gardens of Heligan in Cornwall. This was the residence of the Tremayne family from 1600s until the 1970s. Was Convalescent Home in WW1. Gardens became overgrown and house eventually sold off for flats. 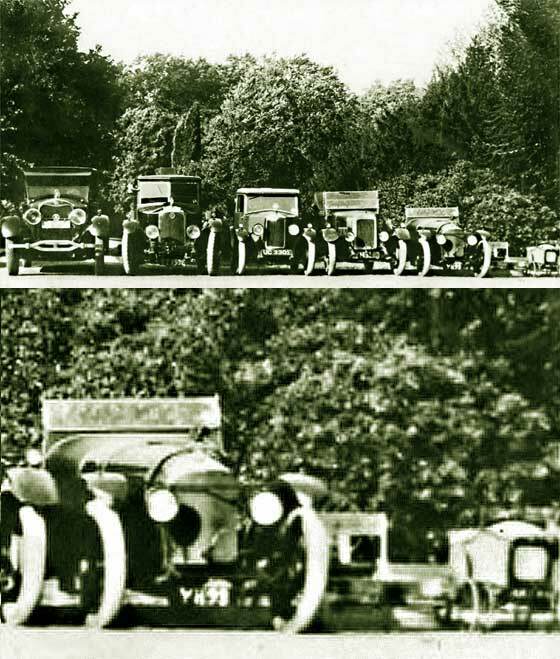 -- Our John Warburton confirmed the car on the left as a big American cca 1926 Lincoln Model L V8, and car on the right is big cca 1925 Vauxhall 23'60 with veescreen coachbuilt body. Lineup of cars photo received from Julian Stephens (UK) who is the Operations Director of the Lost Gardens of Heligan in Cornwall. This was the residence of the Tremayne family from 1600s until the 1970s. Was Convalescent Home in WW1. Gardens became overgrown and house eventually sold off for flats. -- Both are British cars. The car on the left, reg UC, is a London registered 1928 Riley Monaco Saloon, and the car on the right, YH, is also London registered and is 1927 Clyno Royal Saloon. Lovely photo received from David Erasmus from Nottingham (UK) saying his wife's great great grandfather was born in India around 1805 and was a Professed Chef in London in mid-1800's. May be him and/or family. 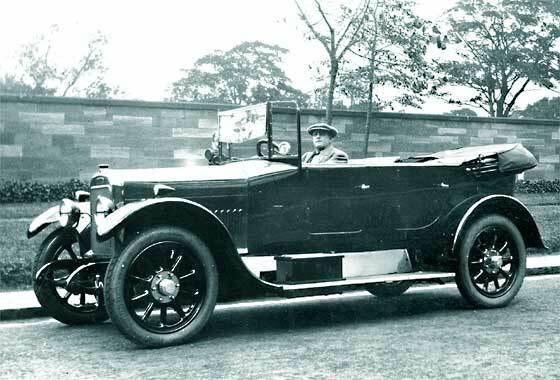 -- Coalscuttle bonnet with rectangular badge so after 1925, no louvers on front so before 1930. The louvers are quite far back on the side of bonnet, plain at front, all suggesting one of the bigger Renaults, and specifically the Vivasix which was made cca 1928. UK side lights. Photo received from Bill Stothard (UK) of the Cudworth History Group saying photo from Great Grandson of Robert Taylor. Phonenumber on back was traced to Yorkshire Traction. -- Web info is that R Taylor & Sons and H Wray & Sons operated under the name of Ideal Service, and were eventually taken over by the Yorkshire Traction. Photo says Made by Reynolds Bros, ex Barnsley cycle makers in 1901, who made various busses for Taylor & Sons. Chassis is French cca 1929 Renault light lorry. Photo received from Bill Stothard (UK) of the Cudworth History Group where original photo has hand-written the word GUILDFORD. 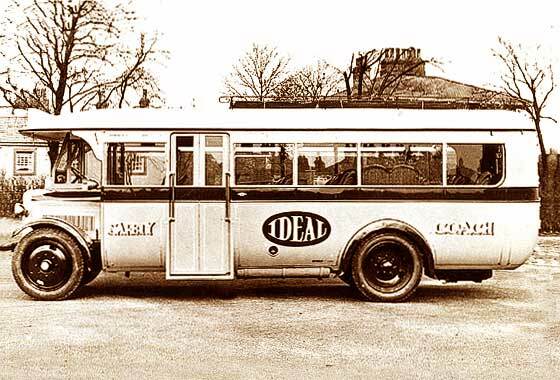 R Taylor & Son 'Ideal' did have a Gilford circa 1934, YG 7518. Is this it? -- Correct spelling is indeed Gilford, reg is late '34 West Yorkshire, and Gilford went into receivership in '35. In '34 current chassis would have probably been a 'Hara' 176, but size and fashion of this photo looks like an earlier forward control 166 or 168. See earlier Gilford on Brighton Run 2002. Another photo received from Raoul Rainer from Stuttgart (Germany) from a batch of 1920s/30s photos he has uploaded on the internet recently. Car carries a city of Berlin registration. Looks like a DKW F1, but not quite! 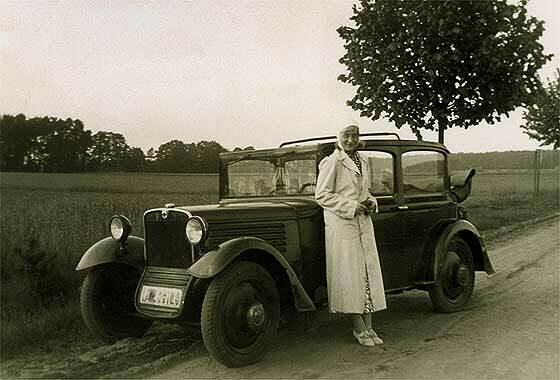 -- Is cca 1932 Stoewer V5 Cabriolet Limousine, German, made in Stettin (Szczecin, now Poland) by company started in 1899 as Gebruder Stoewer. Made good cars, eventually made Wehrmacht jeeps in WW2, so factory dismantled by Russian army and all taken to USSR. Series of photographs received from Julian Stephens (UK) who is the Operations Director of the Lost Gardens of Heligan in Cornwall. This was the residence of the Tremayne family from 1600s until the 1970s. Was Convalescent Home in WW1. Gardens became overgrown and house eventually sold off for flats. 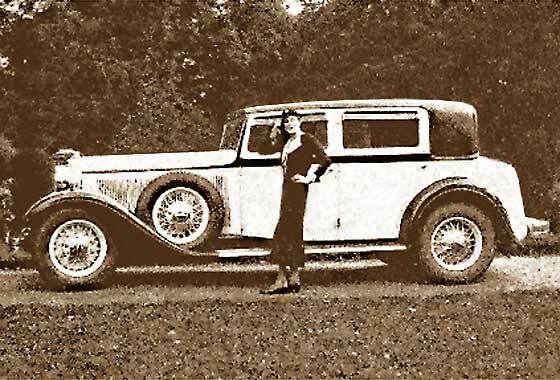 -- A rather grand and expensive Ford, this is a cca 1932 Lincoln KB Limousine powered by a 7 litre V12 engine. The body is similar to a Judkins but seems to have the Dietrich paint job. Another puzzling photo received from Lynne Evans (Australia) who is digitally storing her old family photos of the 40's, and wants very much to label the photos correctly for the next generation. 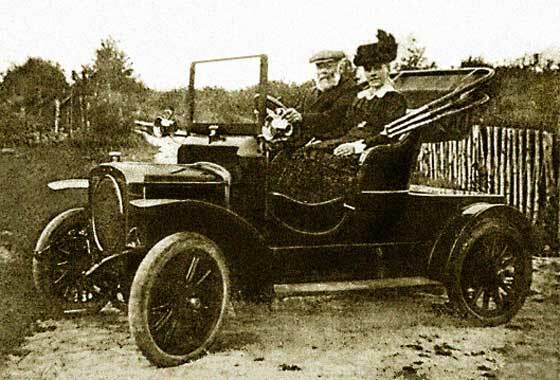 -- This is a General Motors car built in Britain by Vauxhall Motors who were founded in 1857 and making cars since 1903. Became GM in 1925. This is a cca 1934 Vauxhall Cadet VX Roadster. Unusual body with fine lovers and airflow sidelights. 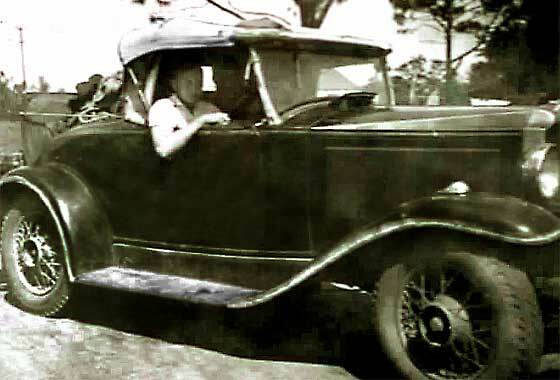 Similar cars were bodied by GM's '31 sub Holden in Australia. Damaged photo received from Sandra Stephens (USA) who is helping a lady in England to find the whereabouts of one of her relatives. The photo was taken in the USA, perhaps in Ohio. It would help to know the year of the car.-- Split rear window. Our New Zealand contributor Mark Dawber has identified this as a cca 1936 Buick Sedan although he cannot be sure of the series because the people are obscuring details, but likely to be a Special. It looks to have straps added over the boot. Another blurry photo received from Lynne Evans (Australia) who is digitally storing her old family photos of the 40's, and wants very much to label the photos correctly for the next generation. This one was marked in bad handwriting as a '1937 Terraplank'-- Not very far off. This is an American Hudson made 1937 Terraplane Series 71. Cannot see any of the body style. Hudson made the 'Essex' as a cheaper line from 1919, and repeated the process with the Terraplane in 1932 to '38. Another photo received from Raoul Rainer from Stuttgart (Germany) from a batch of 1920s/30s photos he has uploaded on the internet recently. Car carries French registration and is a Lancia, possibly Aprilia. 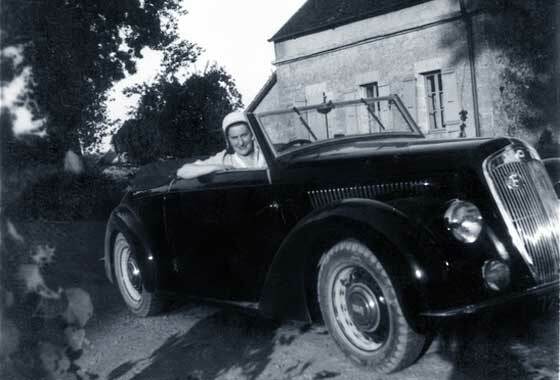 -- We thought it was an Astura, (bodywork above radiator, foglights) but Paolo Giusti of Lancia Forum later advised it was a French (Bonneuil-sur-Marne) built cca 1937 Lancia Ardennes Cabriolet Mylord by French coachbuilder Portout. France built the Ardennes and Belna. 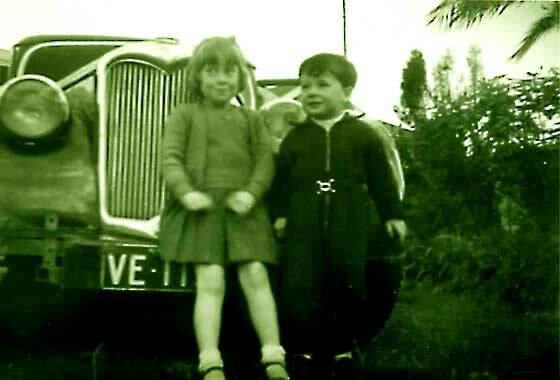 Another photo received from Lynne Evans (Australia) who is digitally storing her old family photos of the 40's, and wants very much to label the photos correctly for the next generation. -- Arty photographer who is no help in deciphering the makes of cars. Radiator is obviously a Riley but so little of the cars is visible it is difficult to tell model. Our Chris Cuss advisees it is one of the post-war RM series. RMA, RMB, RMC, RMD, RME, and RMF, started 1945 and through the BMC years to around 1955. Blurry photos received from Lynne Evans (Australia) who is digitally storing her old family photos of the 40's, and wants very much to label the photos correctly for the next generation. 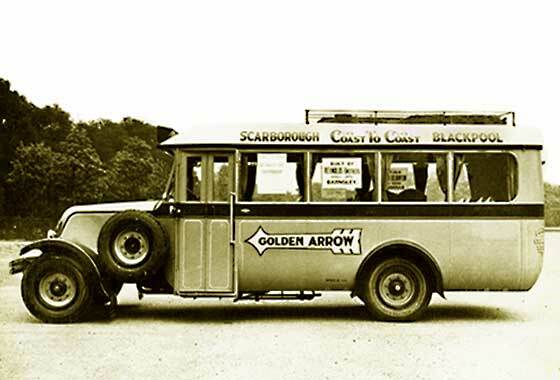 -- This is a British car made by the Standard Motor Company of Coventry and is a cca 1946 Standard Flying Eight Tourer. 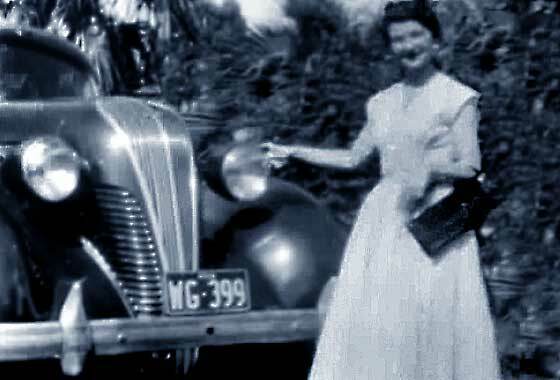 Standard eventually assembled cars in Australia but not until the mid 1950s. The term 'flying' came from position of British flag appearing to fly backwards in the top of the rad. 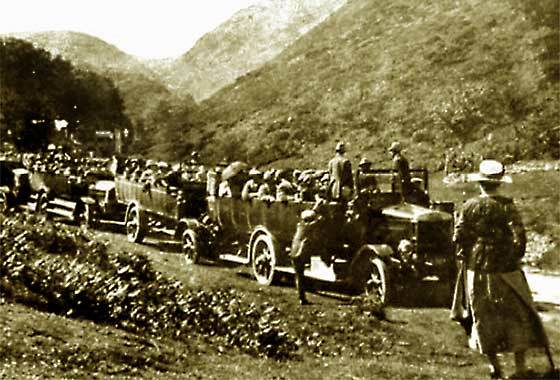 Rather poor photograph received from Barrie Raynor (UK) who requested identification of the charabanc photographed in Cardingmill Valley in the Shropshire hills. They think it was taken in the 1920s judging by the dress of the woman in the foreground. -- Regretfully the photograph is of such bad quality that it is impossible to make an accurate identification. We need reasonable quality scans as it is the detail that provides the identification. Our guess is a cca 1919 Dennis. Lineup of cars photo received from Julian Stephens (UK) who is the Operations Director of the Lost Gardens of Heligan in Cornwall. This was the residence of the Tremayne family from 1600s until the 1970s. 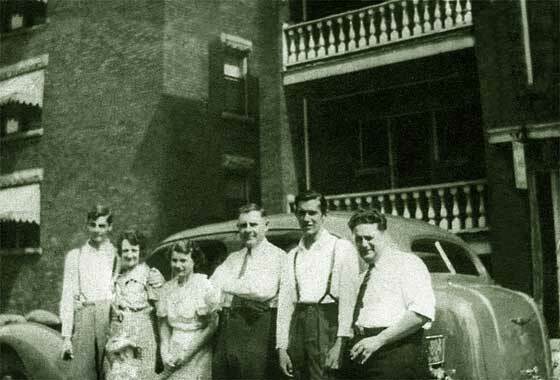 Was Convalescent Home in WW1. -- 1927 London registered. As the photo is poor quality, this car will likely remain a puzzle. Possibly a special of some sort. The car is small and low, even compared with the Clyno. Bentlyish rad. The Adamson cyclecar looked similar, but was gone 1925.